So after loads of rumours and more rumours, Microsoft has finally unveiled what we were expecting and waiting for. At an in Los Angeles, the software giant has unveiled its very own tablet called the Microsoft Surface which would go on to run on Windows 8 OS and also Windows RT OS which is specially developed for devices which run on ARM-based chips. Going by the specs, then it is all basic and sweet. The Microsoft Surface would arrive in two flavours; one powered on Intel’s 22nm Ivy Bridge chips running Windows 8 Pro, and another Surface powered by an ARM chipset and Windows RT. The Microsoft Surface with Windows RT OS is just 9.3mm thin and weighs only 676 grams. There is a 10.6 inch screen Corning Gorilla Glass 2 which arrives with a ClearType HD Display of unknown resolution. Oh it also has dual antenna for better Wi-Fi connectivity. The Windows Surface with Windows RT would ship in two versions, one in 32 GB and another in the 64 GB. This tablet also arrives with a built-in kickstand. The casing of Surface is created using a unique approach called VaporMg (pronounced Vapor-Mag), a combination of material selection and process to mould metal and deposit particles that creates a finish akin to a luxury watch. Starting with magnesium, parts can be moulded as thin as .65 mm, thinner than the typical credit card, to create a product that is thin, light and rigid/strong. The other version of Surface which would run on the Windows 8 Pro version is a bit thicker and bulkier than the Windows RT version at 13.5mm and 903 gram. The 10.6 inch touchscreen with ClearType Full HD display is also here. It arrives with dual Wi-Fi antennas but the surprise is a full USB 3.0 connectivity. The magnesium casing and in-built kickstand are also included. It comes with 64 GB and 128 GB of storage which is good haul over the Windows RT Surface. Additionally, the Intel version will include additional digital ink support through a pen that magnetizes to the body of the tablet. The Microsoft Surface arrives with front and rear camera of unknown resolution. 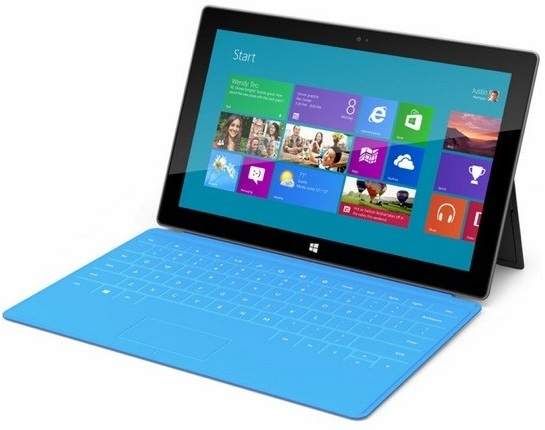 Also Microsoft has announced that the tablets will arrive with two covers which are Touch and Type. The Touch Cover case is an add-on that provides a 3mm thick typing surface with a multitouch trackpad. Whereas the separate Type Cover will add tactile keys as it sacrifices thickness and adds another 5mm to the tablet. Microsoft has not announced the pricing of the tablets but it is expected to be priced competitively with other ARM based tablets and Ultrabook PCs.